WASHINGTON – Today, as House Democrats went back on their promises to constituents and elected Nancy Pelosi as Speaker of the House, the NRCC launched its first paid campaign ads of the cycle. 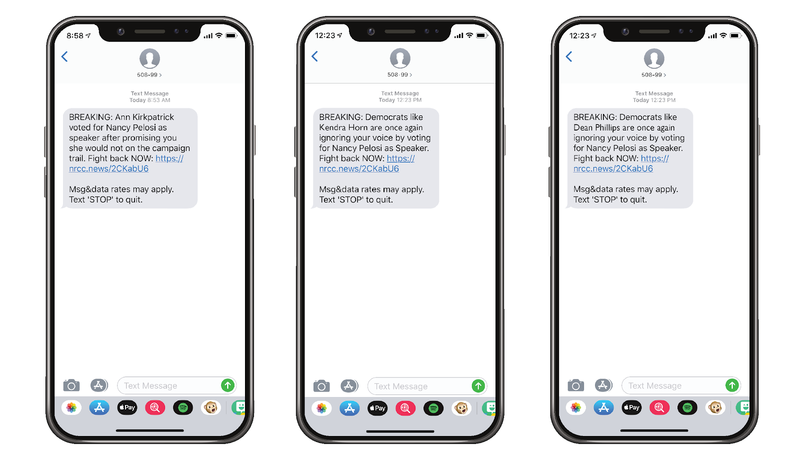 Immediately after the Speaker vote, voters in districts across the country received text messages, paid for by the NRCC, informing them that with their first vote as a member of Congress, their Democrat Representative has already sold them out to the radical left and voted to hand the Speaker’s gavel to Nancy Pelosi. Today’s vote sets the tone for what voters can expect from congressional Democrats as the party continues to follow their radical base and march to the left on everything from immigration to taxes to national security.The paid targeted text messages were sent to the following districts: AZ-02, CA-10, CA-21, CA-25, CA-39, CA-45, MI-11, MN-02, MN-03, NJ-03, NM-02, OK-05, TX-07, TX-32 and VA-02. You can see a sample of the text messages below.